“Get Smart” provokes deep thought about how to think. Each chapter goes in detail of comparing two opposite ends of thinking, such as, “Slow Thinking Versus Fast Thinking” and “Flexible Thinking Versus Rigid Thinking,” while advising when to do which. Brian Tracy helps individuals achieve goals whether it be business or personal. He speaks at events regularly. Also, “He has studied, researched, written and spoken for 30 years in the fields of economics, history, business, philosophy and psychology. He is the top selling author of over 70 books that have been translated into dozens of languages.” That quote was taken directly from his about page, linked to in the beginning of this paragraph. One of my least favorite parts about “Get Smart” is that I felt it was ultra-conservative, catering to the corporate worker trying to work their way up in a company. That may be a positive outlook to some, but if you read my blog you know I live and breathe entrepreneurship. In the second half of the book Tracy actually starts talking about how entrepreneurs are successful by their way of thinking. However, the way each chapter is devised early on it’s not showing at all how to succeed as in individual. I love how Tracy uses psychology and philosophy. I dabbled in philosophy in college and loved it. Psychology has always been extremely interesting to me, and Tracy is able to leverage his time in business and background on the subject to provide chilling knowledge of how to be a successful thinker. Thinking right is not affected by technology. It is one of the few things – maybe the only it holds true to. Technology may help us get our thoughts of what we need to do done quicker, and it may slightly alter how we go about our thoughts, but successful thinkers can adapt to new technology and the digital age. Another awesome thing Tracy does in “Get Smart” is provide “Action Exercises” at the end of each chapter. Tracy publicly speaks, provides seminars, and workshops, so he knows the importance of getting people not to just read a book, but actually apply it. It ultimately makes his work more credible if people use it and see it working. This book didn’t “wow” me, but I did enjoy it. I would give it a 7/10 if I was forced to put a rating on it. I don’t thing it’s quite at that 4/5 or 8/10 mark, but still a good book to have in your arsenal. 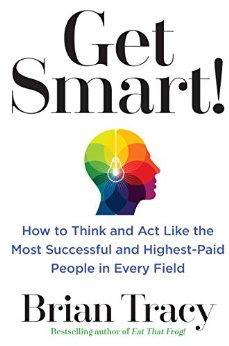 If you are interested in reading “Get Smart” pick it up on Amazon while supporting my blog!